PVC Chandeliers from ShopWildThings are pretty, popular, and come in a variety of colors and sizes! 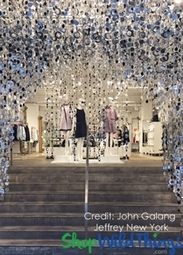 PVC is a lightweight and flexible die-cut material. Each bead is attached to the next using lightweight jump rings. Because they are so lightweight, the PVC pieces will move around and catch light with the slightest breeze, adding visual further visual interest to your Decor! Make sure to check out the matching beaded curtains. 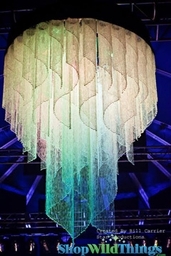 Just about every one of our PVC Event Chandeliers have a coordinating curtain. And because the beads are attached with jump rings, adjusting the length of ANY PVC item is a snap! Be sure to check out our PVC Beaded Curtains as well. 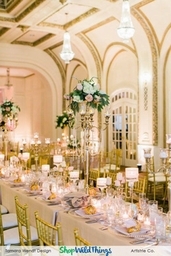 They can help to really tie the look of your venue together. Use PVC Beaded Curtains to create a backdrop, and hang coordinating PVC Chandeliers. 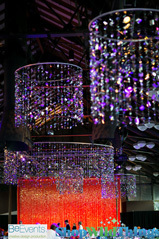 Try hanging the chandeliers in a grouping to create the illusion of one huge chandelier. 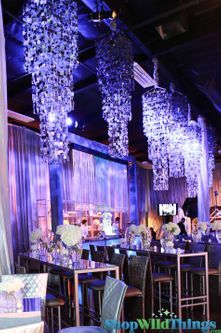 We also carry many other styles of chandeliers for weddings and events like Tiered Multi-Level Chandeliers, Gypsy Chandeliers with Multiple Arms and Draping Crystal beads, and more. View & Order ShopWildThings PVC Chandeliers below, or see our entire HUGE Chandelier Collection HERE! 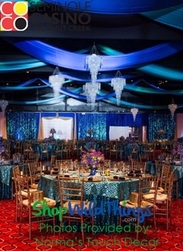 ShopWildThings is an industry leader in providing beautiful lightweight PVC Chandeliers for the Event Decorating Industry. 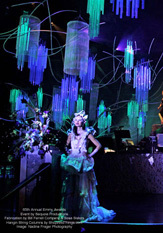 Looking to create a spectacular scene at a fraction of the cost of real crystal? Check out our High-Quality Acrylic Chandeliers. They install quickly and easily and are used by the leading Event Planners in the world! We carry huge stock levels, and ship quickly both in the U.S. and Internationally. Chandelier Frosted "Capiz" Circles - Matte Silver - 3' Diameter! Chandelier "Shimmy" - Silver 8.5" x 19"
COMING SOON! Chandelier "Kalina" 23.5" x 9" - Clear Crystals & Silver Squares! Chandelier, Spangles - White Iridescent - 8" x 18"